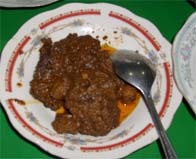 Here's a simple recipe for Beef Randang or rendang from Padang, Sumatra Indonesia. 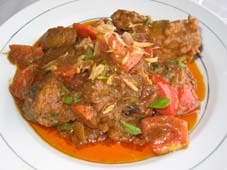 Chicken can also be used with this recipe but do not simmer as long. Grind the garlic, ginger, chopped chilies, galangal and curry powder (mix with a few drops of water before adding the powder) in a mortar, add a drop or 2 of the coconut milk to ensure it is a runny paste. Add this paste to the hot oil in a wok, fry for 30 seconds and add the beef and slightly fry until the meat is just starting to turn light brown and then add the thick coconut milk, the lemon grass. Bring to the boil and then turn the heat completed down and simmer with the pan covered for 1.5 - 2 hours. The coconut milk will reduce so keep and eye on it and maybe add a touch more coconut milk during this time. After the 2 hours you can eat this dish as a wet curry or turn the heat up to medium and then reduce the coconut milk completely down and then pan fry the beef.